A 2014 survey of truck drivers across America discovered that some of the most complained about routes included trips to and from cities in the northeastern region. While some cited reasons such as heavy traffic and congestion, most noted that it was the bad weather and overall extreme weather conditions of the area, that made it the most significant compared to other parts of the country. New Bedford towing and recovery services could also tell you a thing or two about the effects of traffic, congestion, and bad weather on the trucking industry, particularly companies that specialize in heavy-duty semi truck towing. What is Extreme Conditions Towing? Even in the best of weather, heavy-duty towing in New Bedford and the surrounding area can be dangerous. Semi trucks and other weighty vehicles require different equipment, methods, and approaches to towing and recovery than the average personal vehicle. But when you add in road hazards due to inclement weather, which can pop up at just about any time of year, the dangers of driving in New England increase significantly. Even summer storms and fall winds can create unsafe driving conditions, especially for truck drivers on busy highways and interstates. 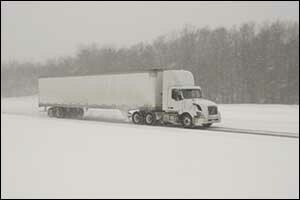 Extreme conditions towing can include rain, sleet, snow, ice, wind, and freezing temperatures, all of which dominate the weather in Massachusetts. The roads become slick and icy, making driving – even for the most knowledgeable and experienced behind the wheel – extremely difficult. When a semi truck goes off the road, whether it tips over, rolls over, or gets stuck off the shoulder, it requires heavy-duty equipment from New Bedford towing and recovery services. It pays for truck drivers and trucking companies to build relationships with service providers of extreme conditions towing in the local area so they will know who to call in case of an emergency without delay. If you are in your personal vehicle and your car breaks down, or you go off the side of the road and into a ditch, you can simply contact your road-side assistance provider through your insurance company or ask first responders to contact a local tow company. Nearly every company that provides New Bedford towing and recovery services can help you without concerns about having the right equipment or enough manpower to get the job done right. However, when you are driving a heavy-duty vehicle, such as a semi truck or even an RV, you need to contact a company that has the equipment, knowledge, and experience necessary to deliver heavy-duty towing in New Bedford and the surrounding area. Combine the size, type, and weight of your vehicle with New England weather conditions, and you will quickly realize the importance of extreme conditions towing. You require mega equipment that is designed for recovering and towing large semi trucks and other massive vehicles. Big Wheel Towing & Recovery has a fleet of heavy-duty vehicles designed to meet the needs of our customers. Our fully-trained WreckMaster 6/7 and HAZWOPER certified team and our modern, specialized equipment can get you and your truck out of just about any situation. We even have a completely certified dive team that can recover vehicles that find their way into the water. Another essential ingredient that is required for any company that promises Greater New Bedford towing and recovery services for heavy-duty, professional vehicles, is always to provide quality and dependable service. Our services are available within a 50-mile radius of our Freetown, MA yard. Whenever, wherever, and whatever you need with regard to heavy-duty or extreme conditions towing, you can count on Big Wheel Towing & Recovery to get there and get the job done without fail. Whether you are in Middleborough, Taunton, Fall River, Brockton or somewhere out on the Cape, our team will respond quickly to provide you with the semi truck towing services you require to recover your vehicle. Whether you are in the middle of a Nor’easter, seasonal hail storm, heavy snowfall or rush hour traffic, our crew will come to you and provide trusted, reliable heavy-duty towing in New Bedford or anywhere in the surrounding area. Just give us a call, and we will take care of the rest. Our team has many years of experience working with all of the dangerous and unpredictable weather conditions found right here in New England. We have the knowledge and the equipment to extract, recover, and tow any size vehicle from the scene. You can trust Big Wheel Towing & Recovery to get your truck out of any situation, no matter what. Contact our team by calling 1-508-763-5927. If you work in the Southern New England area or drive through this region frequently, consider adding us to your speed dial. You don’t want to get stuck with towing services that primarily deal with personal vehicles to try and get your semi truck or other heavy-duty vehicles to safety. You can also use our online contact form to get more information about Big Wheel Towing & Recovery and all of the professional services we provide.